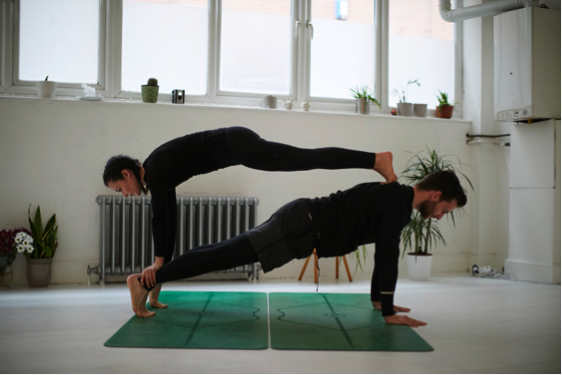 I’ve put together a little bit of inspiration for some Boxx Buddy Yoga, you can try with your partner, family or friends. There’s a mixture of poses which will help build strength, some to stretch out and others just because they feel nice and relaxing. The word ‘Yoga’ means ‘union’ and what a better way to practise it hey? Partner up, make a little space and most importantly keep talking to each other – what feels good? What feels socially awkward? Have fun with it and show us your Boxx Buddy Yoga pictures on Instagram! One person gets into downward dog - start with the knees slightly bent so you can lift the sit bones higher to the ceiling. The buddy positions their hands about their leg length distance from the downward dog buddies hips. Step on to the sacrum (flat part of the lower back) one foot at a time, always checking in and making sure it feels okay for your buddy. 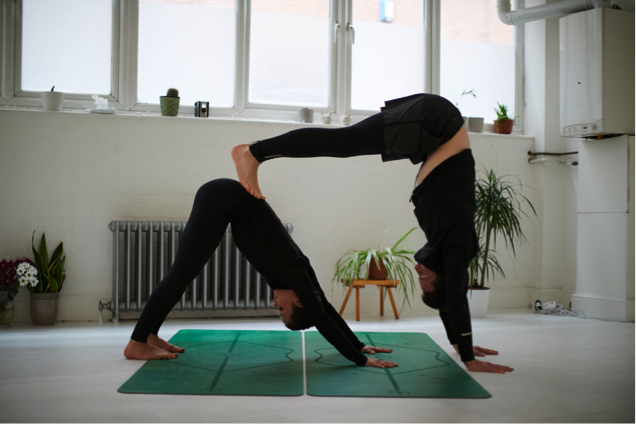 The person in downward dog will get an extra stretch through the back of the legs and the other will get an inversion and strengthen the shoulders! Draw straws for who goes on the bottom. Make sure the hands are stacked underneath the shoulders and firm up the legs and core. Top buddy starts by gripping the ankles then stepping one foot on at a time…. See how long can you hold it for! Take your legs as wide as they will go and bring your feet together. Grab a hold of your buddies opposite wrist and lean opposite ways. You both should feel an opening through the side of the body and a little hamstring stretch too. Switch arms and do the other side. The first person comes to a seated forward fold with the legs together (knees can be bent if needed), then the buddy leans back over them. The bottom person will get deeper into their forward fold and the top person will get a stretch through the lower back and an opening through the chest. Take turns and see which one you prefer!